Photo by Andre. 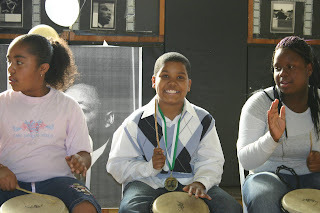 Students in grades 4-8, from all three schools in the district, performed together with Mentor Artist Ken Doumbia. 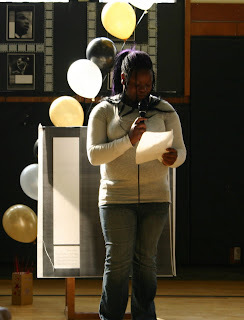 Cheryl, from MLK Academy, performed her “Yes We Can,” poem in front of a packed audience. Three students performed their poems with the help of Mentor Artist, Mimi Baxter. Middle school student, Deachen, was just one of young camera crew workers at the event. 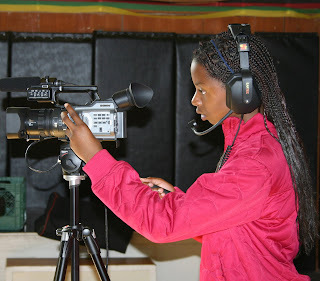 They helped to document the day and use the footage to create a movie of the event with help from Artist John MacLeod, from the MYC Youth Center. 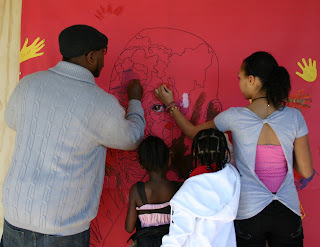 Community members, kids, and artists worked together to create a beautiful tribute mural to MLK Jr. Mentor Artist Evan Bissell, who developed the idea, was on hand to lead the participants through the creation.